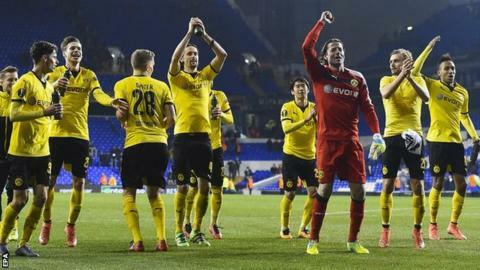 They are eight-time league champions and one of the most successful clubs in German football history. The first German side to win a European title (the 1966 European Cup Winners' Cup) and champions of Europe in 1997. Three-time German cup winners. Yet Borussia Dortmund say they are enjoying their "best season ever" - despite lying second in the Bundesliga, behind Bayern Munich. After 27 of their 34 league games this season, 20 wins, four draws and just three losses mean they have 64 points. It is the most, they say, at this stage of a season in the club's 106-year history. Dortmund won the league in 2010-11 and again the following year, when they set a Bundesliga record of 81 points. After 27 games of that season, they had 62 points - two fewer than they have this year. Bayern broke that record the following season, winning the title with 91 points as Dortmund slipped to second, also their finishing position in 2013-14. Now - 10 months on from an uncharacteristic seventh-place finish under Jurgen Klopp - they are five points behind Bayern, but 16 ahead of third-placed Hertha Berlin. And Dortmund know they, and Bayern, are well ahead of the rest. "You would have won the championship with this points tally 15 years ago," the club add. African Footballer of the Year Pierre-Emerick Aubameyang has scored 32 goals in 36 games in all competitions for Dortmund this season.